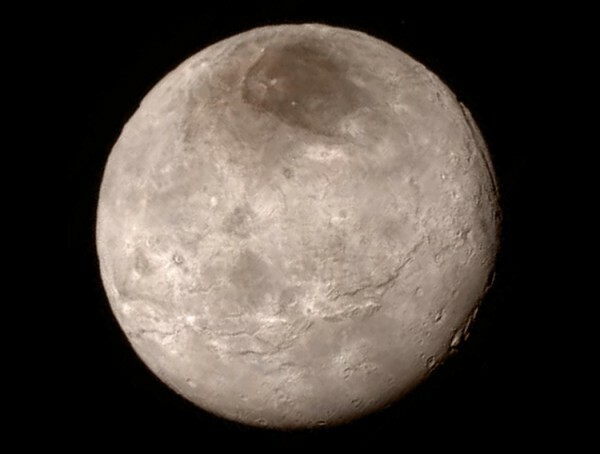 Caronte (Charon for English speakers) is one of the major moons of Pluto, named after the boatman coming from Greek mythology and has not been photographed until this year by the probe New Horizonts in July. A tenth the size of the Earth is not the only satellite of around Pluto as once thought until 2005/2006 but is the only round satellite and the rest … the rest potato-shaped gravitational interactions. The picture you see is the one that currently has a higher resolution of the satellite to date and this made 500,000 km away from the. Noting that the odd stain on the north pole (we do not know it) has been called Mordor and has a size of 1000 km radius. The funny thing is that due to its proximity, Charon is not entirely “circular” but its form varies by Pluto’s gravity in its orbit just over 6 days. But compared with other satellites, it is round. In addition it is thought that other satellites are only Kuiper Belt asteroids that have been captured by the orbit of Pluto-Charon tandem. No atmosphere (that we know) is that pint ice (water), ammonia with active geysers that spew ice into space.